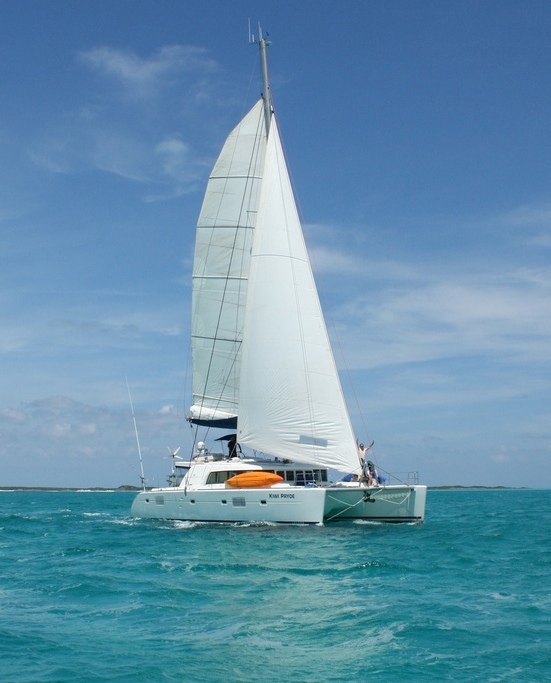 KIWI PRYDE (now 8 pax catamaran in Bahamas) offers 10% discount on charter rates for charters taken between 1st September and 15th November 2013 PLUS 4 free dives when a weekly charter is booked. Kiwi Pryde is a 51ft Catamaran Yacht and the first of the big boat cruising multihulls by Lagoon. Maneuverability and speed along with comfort and luxury for long cruises are this yacht's specialty. The interior finish consists of light oak alpi and has a non skid laminated wenge wood floor. Why not start the charter at Staniel Cay, right in the midst of the Exumas......fly from Nassau to Staniel Cay for approx.$130 per person with Flamingo Air, and either return by Flamingo, or sail the one way trip back to Nassau.. You will have more time exploring the Exumas this way – and the view from the plane over the Exumas is out of this world and sets the scene for an amazing charter experience. Get your cameras ready! Captain Craig will arrange to meet you at the Airport, courtesy of a golf cart and drive you the short ride straight to Kiwi Pryde – let the charter begin!